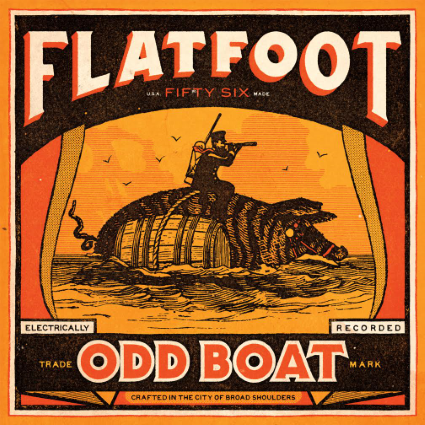 Seventeen year veteran Celtic Punk pioneers, Flatboat 56, have released their seventh studio album, Odd Boat. Amidst the turbulent political atmosphere that has become the norm in 2016-2017, this Chicago-based rock band is a welcome breath of fun-loving hope mixed with just enough drunken mischief and sorrowful woe to earn this album a place among their Celtic Punk counterparts from Boston. With tracks drenched in struggle and brotherhood, Flatfoot 56 sends a reminder of Chicago’s historic roots as one of America’s toughest and most immigrant depended cities. 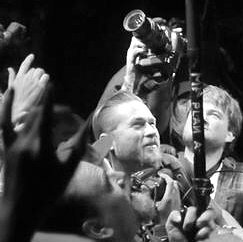 Songs reflecting the unique culture of American-Irish driven Celtic Punk like “Stutter” and “The Crippled” are a classic sentiment that is unique to this genre of music. Songs like “Ty Cobb”, “Odd Boat”, “KPM”, and “A Voice” really set the tone for what I feel is a great new album by Flatfoot 56. I love the anthemic quality of “Ty Cobb”, the bagpipes on “Englewood” (you can never have too much bagpipe in my opinion), and the infectious resonance on “A Voice”. Traditional Celtic Punk themes include politics, culture, religion, drinking, and working class pride… Odd Boat leans toward the culture and working class pride. While I do love a great political statement, this album steers clear of that realm. And while Odd Boat may not outwardly champion drinking, I can imagine a great time with a few brews listening to Flatfoot 56! While each record received its fair share of acclaim, the quintet exploded onto a new level with 2010’s Black Thorn. Landing the band on a total of 9 Billboard Charts, Flatfoot 56 proved it could consistently reach an expanding audience while treading in a genre not often associated with widespread success. This success was advanced even further with song placements in the hit TV series “Sons of Anarchy” and the video game “Watchdogs”. After the success of “Blackthorn”, Flatfoot 56 hit the studio yet again in 2012 to record “Toil”. This album would further solidify the band as a consistent force to be reckoned with.